Buy Paint (AF) Fremmerlid a Coffee. ko-fi.com/paintaf - Ko-fi ❤️ Where creators get paid by fans, with a 'Buy Me a Coffee' button. 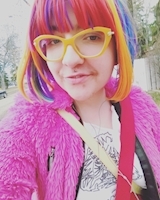 I'm a non-binary artist living in Edmonton, AB. I vlog on youtube and have books for sale on Amazon. I am a spoken word poet. Secured Payments. Support goes to Paint (AF) Fremmerlid's account. Upgrade Paint (AF) Fremmerlid to a yearly Gold Membership with a one-time payment.